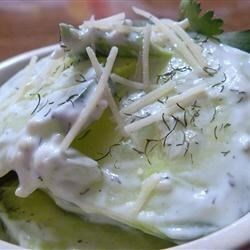 "This cool, creamy salad is lighter than other versions with sour cream. It's a great addition to summer cookouts." Arrange cucumber slices in a single layer in the bottom of a bowl. Sprinkle with salt and pepper. Add a layer of onions, and top with a layer of yogurt. Continue layering all the remaining cucumbers, onions, and yogurt this order. Top off with a final layer of yogurt. Sprinkle with garlic powder, and parmesan cheese. Not a big yogurt fan myself, but I decidedto giveit a try. Still had a very strong yogurt taste. i'm sorry but I just thought this was flavorless. And it calls for way too much yogurt.